After training to be a pastry chef, I bounced around trying different career paths until I found one that fit, stay-at-home mom. Thankfully my husband, Norman, has come around to seeing the value of having one parent home now that we are wearing clean clothes on most days and eating something other than cereal for dinner most nights. I'm sure my boys, Max, 6 and, Jack, 14 like having me around more too, you just have to be able to interpret those eye-rolls with love. I find that, as a mom, the need to connect with other women, especially other moms, is strong. 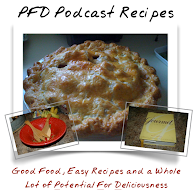 I am hoping to expand my community as well as bring some community to moms who are in need of a weekly dose of 'girl talk' through PFD Podcast. Hopefully you can share in our good times, laugh at our disasters and find comfort in knowing that all moms face challenges.